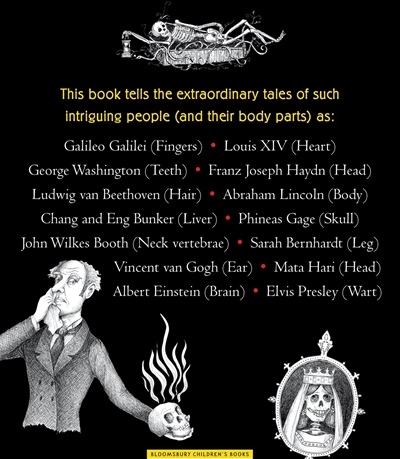 From the book's publicity .. “From the kidnapping of Einstein's brain to the horrifying end of Louis XIV's heart, the mysteries surrounding some of history's most famous body parts range from medical to macabre. Carlyn Beccia explores the misadventures of noteworthy body parts through history and springboards to exploring STEM topics such as forensics, DNA testing, brain science, organ donation, and cloning. The engaging tone, wonderfully creepy subject matter, and delightfully detailed art are sure to capture even the most reluctant readers. Thomas Edison / Last Breath. Susan MacDougall's review proving that EIN keeps a watch out for ELVIS in nearly every publication! 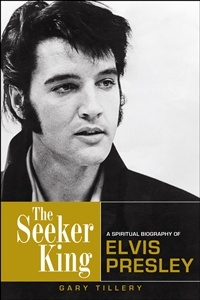 When I saw the blurb, I thought that this might be a book to bring in more Elvis fans. Was I right? Aimed at 10 to 14 year-olds, it is described as a fun way to educate children about forensic science, genetics and DNA. What has happened to body parts of various famous people after, and even before death, is used by way of illustration. Examples include Galileo, King Louis XIV, George Washington, Franz Joseph Haydn, Ludwig van Beethoven, Abraham Lincoln, Sarah Bernhardt, Vincent van Gogh, Mata Hari, Albert Einstein, Thomas Edison -- and Elvis Presley. 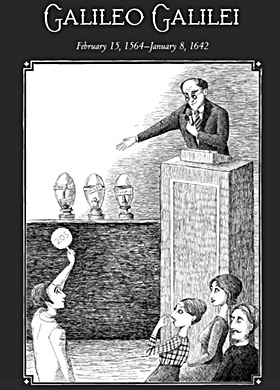 The somewhat macabre contents include information and anecdotes concerning the dying process, decomposition of the body, cannibalism, body preservation, conjoined twins, tissue and organ transplants, body snatching and kidnapping, souveniring of body parts, castration, phrenology, hair jewellery, DNA testing, vampires, electric shock treatment, cryonics and cloning. The book is written in a facetious manner intended to appeal to children. The illustrations are cartoons. Beccia provides “fun facts” relating to the relative lengths of time bodies take to be reduced to skeletons, depending on whether they are buried, immersed in water or exposed to the air. Intestines are the first to rot, the brain next, and teeth and bones the last. The book starts with love stories where a partner could not bear to part from his/her beloved, even when dead, and kept the body or a part of it at hand. For example, Juan Peron kept his wife Eva Peron’s embalmed corpse in the dining room where he ate. • Percy Bysshe Shelley’s heart wouldn’t burn when his body was cremated, so it was kept and given to his wife Mary Wollstonecraft Shelly. • When Galileo died, people souvenired his vertebra, fingers, and one of his molars. • After Haydn’s head was stolen and replaced with another, his body ending up with two heads in the grave. • The snatching of bodies to sell to medical schools became so common by 1850 that six to seven hundred bodies were being stolen yearly from New York graves. • George Washington had great trouble with his teeth. • People wanted a piece of Beethoven’s hair as a souvenir, much as people might collect autographs today. • Analyses of hair samples show that Beethoven suffered from lead poisoning, Edgar Allan Poe from arsenic poisoning. • Alexander the Great’s body was preserved in a vat of honey, while Horatio Nelson was pickled in a cask of brandy until his body could be brought on land. Some of the illustrations are kinder than others! So how does this publication relate to Elvis Presley? The chapter on Elvis is called Elvis Presley: warts and all. Joni Mabe collected more than thirty thousand Elvis artifacts for her Panoramic Encyclopedia of Everything Elvis. The pride of her collection is “one hunk, a hunk of burning wart”. Beccia repeats the old stereotypes about Elvis’s unhealthy diet and lifestyle. At the same time, a DNA test of Elvis’s hair revealed that he had real health problems: hypertrophic cardiomyopathy, and genes associated with glaucoma, migraines and obesity. The technique of cloning and stem cells is described, but trying to clone Elvis by cloning his wart would result in cloning a virus, not Elvis himself. 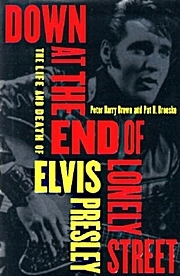 Carlyn Beccia's noted sources are Wilborn Hampton’s Elvis Presley; Pamela Clarke Keogh’s Elvis Presley: the man, the life, the legend; James D. Watson & Andrew Berry’s DNA: the secret of life; and Peter Guralnick’s Careless Love (the unmaking of Elvis Presley). Her quotes in the text are taken from Joni Mabe’s online Panoramic Museum of Everything Elvis which is available online on Youtube. The fact that Carlyn Beccia only considered volume 2 of Guralnick's Elvis biography - his later life - suggests that she was looking for selected facts that suited the tone and style of her publication. She obviously wasn't after a balanced assessment of Elvis as a person, and from her writing it would be surprising if Beccia even read Guralnick’s very solid work from cover to cover. Einstein apparently ate greasy sausages and chocolate-covered ice cream cones that must surely have adversely affected his health too. But it’s Einstein’s brain that’s been the centre of attention to ascertain whether the brain structure could explain his genius (did he have any warts?). The corpus collosum is a bunch of fibres connecting the left and right sides of the brain. These fibres allow the left and right hand sides of the brain to work together. Einstein’s brain contained an unusually large bunch of these fibres. Scientists still aren’t sure if this is the reason for his great intellect. The body of Queen Nfertiti of Egypt cannot be identified by DNA testing because of the “rampant” inbreeding between the Egyptian royals, muddying the gene pool. At least we know where Elvis’s wart is and what it can’t say about his DNA. 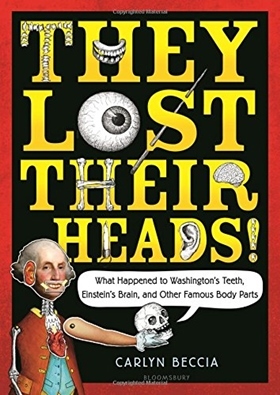 The answer to the question in the title “What happened to Washington’s teeth, Einstein’s brain, and other famous body parts?” is that some are in museums and public or private collections, others ended up in buckets in hospitals, burned, buried, thrown away or lost. This same style of educating children with humour is evident too in the British Horrible Histories television series and in Nasty Nature in the British Horrible Science series. David Attenborough’s programs provide more information about animal behaviour without mocking them. I think his programs also appeal to children of all ages without reinforcing stereotypes. This book uses famous people to illustrate forensic science, but often quotes quirky facts, thereby downplaying their achievements and contribution to the world – especially in Elvis’s case. 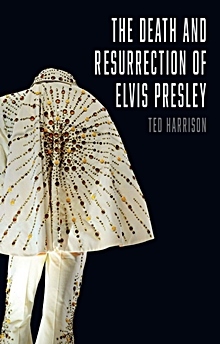 The chapter on Elvis has a facetious and mocking tone, the portrayal of Elvis does him a disservice It shows a back-view caricature view of Elvis in a jumpsuit with split pants. It’s most unlikely to encourage anyone to become an Elvis fan. It's taken a long time for Elvis’ talent and achievements to be better appreciated and while this could be a set-back, it probably won't be. Not recommended for you or your children. It’s his singing talent and compassion for others that matters. Yes, science is important, but is this the right way to teach it? 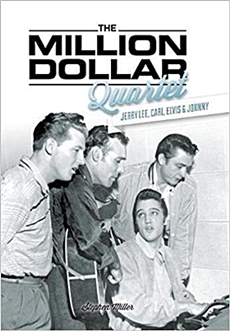 'The Million Dollar Quartet’ Book Review: 'The Million Dollar Quartet’ is the name given to the impromptu jam session among Elvis Presley, Jerry Lee Lewis, Carl Perkins, and Johnny Cash on December 4th 1956. This book by Stephen Miller - from 2013 - includes interviews with the drummer and the sound engineer. 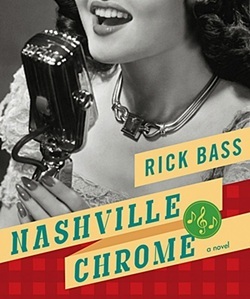 It features a detailed analysis of the music played – and its relevance to subsequent popular music. Go here as EIN book reviewer Susan MacDougall explores this detailed look into a jam session that Elvis fans all know so well... is there really any more to discover?